Earlier in the year the likes of Mike Ross, Sean O’Brien and Richardt Strauss probably expected to be involved in a rugby match abroad on November 5, a clash where one team had failed to register a victory in any previous meetings with their illustrious counterparts. The thing is though, I very much doubt they expected it to be at the Stadio Sergio Lanfranchi in Parma! 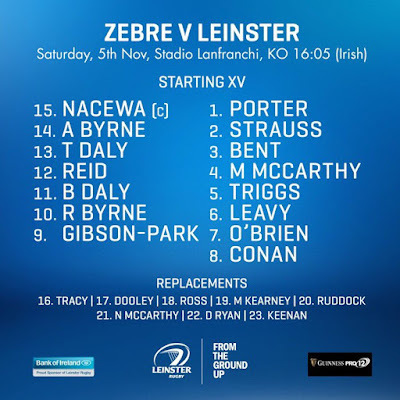 Zebre have played Leinster eight times to date, and eight times they have been the ones on the losing side of the scoreboard. That doesn’t mean all eight were necessarily easy, mind you - and much like Ireland’s constant shortcomings against the All Blacks, each meeting brings about a new hope that the duck can be broken. And although the two Italian clubs are in their familiar positions at the foot of the Pro12 table already, Zebre have had some notable results...taking losing bonus points off Newport, Cardiff and even Glasgow before an amazing win away to Edinburgh last week. Leinster certainly can’t expect victory to come easily this weekend, top of the table or no. 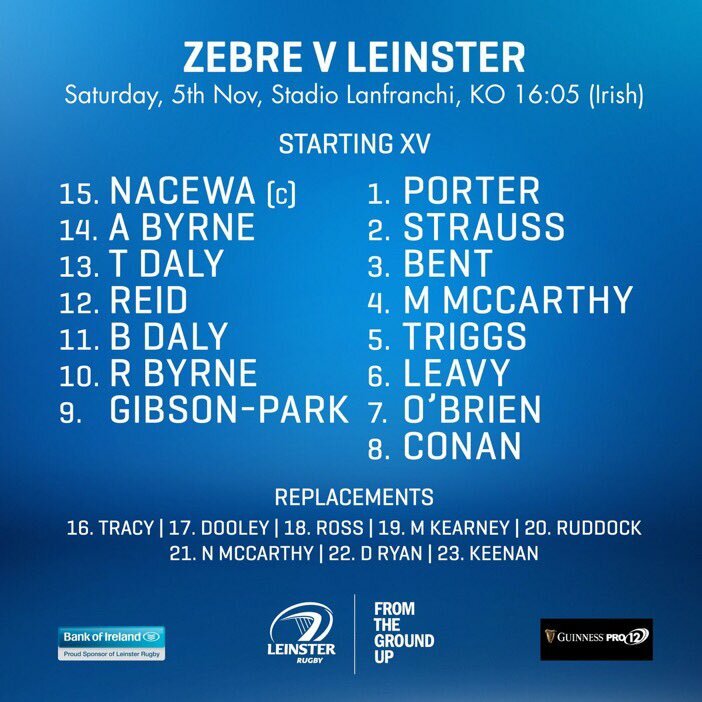 International duty has meant we can’t pick exactly the same side that overcame Connacht, but there are some key similarities to the lineup, not least the back row of Leavy, O’Brien and Conan...not often does Leinster 6/7/8 combo get to play two weeks in a row and that can only be a benefit to us. Sadly for Rory O’Loughlin he misses out on the trip after doing well last time out but this provides an opportunity for Tom Daly to step up and stake a claim for a first team spot. As if we didn’t have enough problems with the McGraths, the McCarthys, the Kearneys and the Byrnes in our squad...now we’ve a pair of Daly’s to sort out! But I wish him all the best on his debut. An interesting area on the pitch for Leinster will be in the second row...Mick Kearney and Ian Nagle have done well in support of Dev Toner this season and this week it’s the turn of Mike McCarthy and Hayden Triggs to show what kind of starting shift they can put in...with James Ryan also on the fringes, I can’t overstate just how well stocked we are. Speaking of well stocked, returning to the back row we have opted yet again for a 6/2 split on the bench with Rhys Ruddock and Dom Ryan ready to join the fray should the going get tough in the latter stages. Pulling the strings in the 10 jumper will be Ross Byrne, and by the look of things he’s slated for a full 80 minutes. With Gibson-Park and Reid in good form either side of him he should do well. With all due respect to the home side, I reckon I have seen enough from Leinster this season to be at a stage where my expectation levels should be high - this means nothing less than a 5-point return will do. The Warriors won here 33-28 here a while ago...I’d actually take that if offered now and the bookies have us by 7, but I’m going to make my prediction a 10-12 point margin so we can be sure to stay on top of the ladder before the Pro12 takes a breather for a few weeks.